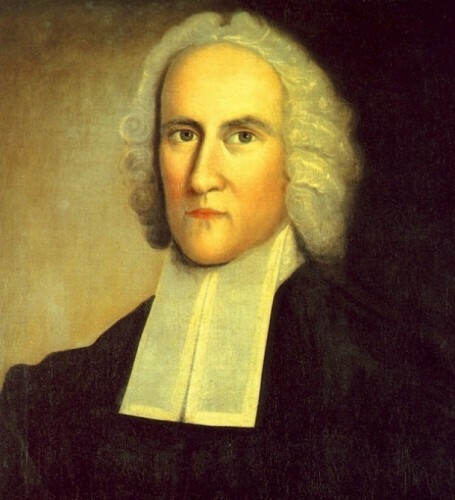 On July 8, 1741, theologian Jonathan Edwards spoke the words of the sermon “Sinners in the Hands of an Angry God” at a Congregational church in Enfield. He could not have known that he was delivering a sermon that has been called one of the most famous ever given on American soil, and about which whole books have been written. What Edwards saw as a falling away from the stern principles of his Puritan ancestors led him to the rousing exhortation of the sermon’s words, and to a frightening evocation of the suffering of hell. A leader of the first Great Awakening in colonial New England, and at that time a minister in Northampton, Massachusetts, Edwards sought to remind his listeners of the fiery punishment that awaited unbelievers, and to encourage them to follow the moral path he outlined. “The Jonathan Edwards Center.” Yale University, 2012. Link. Edwards, Jonathan. Sinners in the Hands of an Angry God. Philadelphia, PA: Presbyterian Board of Publication, n.d. Link.